Wow what a genius invention we have here. I must first apologise to other Marcos owners who may be reading this and already know about the quirky pedal assembly box, but for friends and family "Marcos" is a whole new name to most of them ! I must tell them about the unique pedal assembly box. Statement "There are no actual seats in a Marcos"
"what ? how can a car have no seats ?" "Well how does people of different heights reach the pedals with no seat to move ?" Ah the answer, if you look carefully near the steering cowl there is a small hand dial and by turning it you can move the 3 pedals as one unit either forwards or backwards to suit each drivers leg reach, clever eh ! 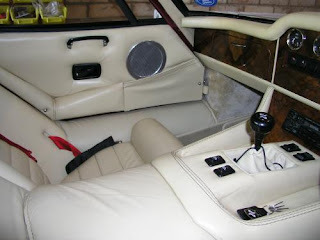 Although this pedal assembly box weighs a bit with all the moving parts in it, if you have ever removed a seat from a normal modern car you will be amazed how heavy they are with all the frame, cushions, electric heated bum elements etc, this Marcos pedal assembly box certainly saves a substancial amount in overall car weight. I don't know of any other cars that use this idea and considered it was designed many many years ago it's quite a clever item. I have started to strip it down as it needs painting and some bits of the frame rewelding to tidy it up a bit, both the Girling brake and clutch master cylinders also need replacing and there is also a clever front/rear brake balance bar with a seperate master cylinder built into the same design. looks as if you have some electrolytic corrosion on the aluminum hydraulic cylinders. you could try gasketing the seating face and the bolts to prevent it from happening again. Fantastic restoration blog you have created here. I’m currently in the process of doin the same thing on a 1986 3.5 Mantula (although nowhere near your level of detail). I was wondering if you knew what to open length and spring rating is of your shock absorbers? I don't have the sizes you require. There is a page on my blog re the suspension as they were special Koni 8212 and from the Tyrell 6 wheeler and i had them rebuilt by a koni specialist.